Simple steps to feed your toddler and preschooler and healthy! When my oldest daughter started eating solid foods, I pictured her eating the same healthy stir-fry dishes and casseroles that I made for my husband and myself. I had a rude awakening when she turned two and suddenly wanted chicken strips every night. While she still loves chicken strips, we’ve taught her to eat a variety of healthier foods as well. Here are seven simple ways to help your toddler to eat a nutritious diet. Picky parents are more likely to have picky children. Eating new foods in front of your toddlers encourages them to do the same. 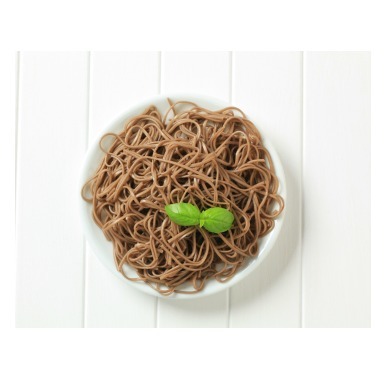 Try a new vegetable or recipe, and be careful not to show negative reactions if you do not like it. Involve them in food prep. My 4-year-old thought she hated celery until she learned to top it with peanut butter and raisins “all by myself,” as toddlers like to say. Studies show that teaching young children to cook encourages them to eat more fruits and vegetables, whole grains, fiber, vitamins, and minerals. Older children can help wash and chop vegetables with a plastic, kid-safe knife. Set out dishes of fruit and other healthy toppings to stir into plain yogurt or oatmeal. Watch carefully if meal prep involves heat, sharp objects, or small ingredients. 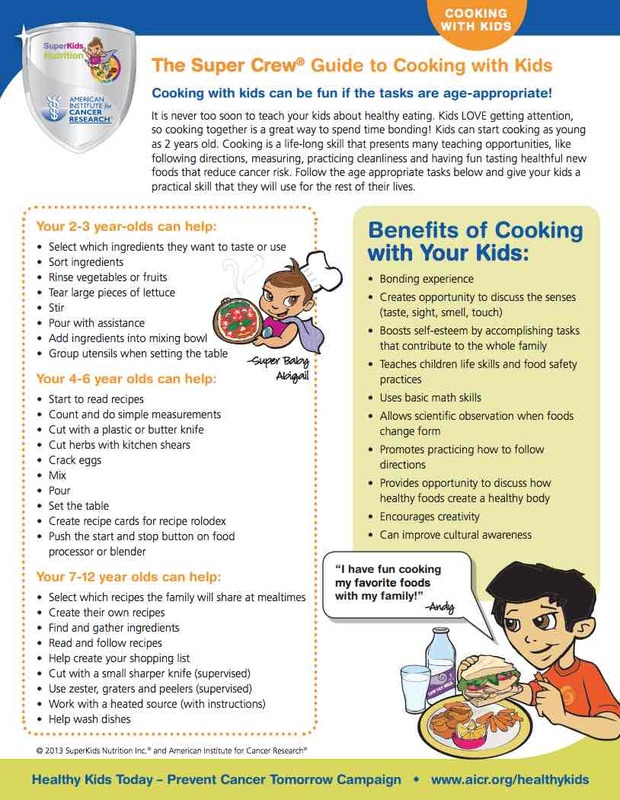 Check out the Super Crew Guide to Cooking with the Kids. Establish mealtime routines that make eating fun and family-focused. Eating as a family allows parents and siblings to model healthy eating. Add to the fun with a creative presentation. Serve colorful meals, and arrange healthy food in a festive way on the plate. Search “food art” on Pinterest for hundreds of ideas to transform healthy ingredients into animal faces, beach scenes, robots and more. For preschool age and older, have them track their colors for a week with the Super Crew Color Tracker. This spring, my 4-year-old helped me plant a garden. She tended to romaine lettuce, cherry tomatoes, cucumbers, and brussels sprouts. She filled the pots with small plastic gnomes, dinosaurs, and other trinkets. She also helped me start a compost bin. Not only did she take pride in her harvest, but she also accepted these foods into her diet for the first time. If your children are curious about where their food comes from, this is a great way to make new fruits and vegetables more approachable. Learn the essentials of starting a family garden. Did you know that a medium apple with its skin contains nearly 9 times more fiber than a cup of apple juice? Juicing removes nutrients, including fiber—good for all tummies—that are found in the skin and pulp of fruits and vegetables. Many store-bought juices contain sugar and other added ingredients. Break out your blender and mix up some fruit and vegetable smoothies in place of juice. You might be surprised–my kids love my beet smoothies because of their hot pink color! 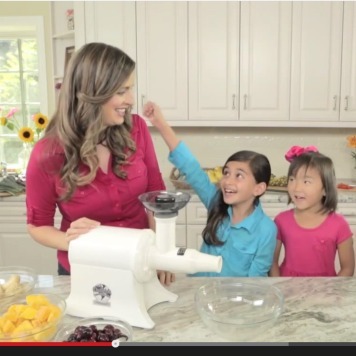 Search for healthy smoothie recipes on Google or Pinterest, or help your children create smoothie recipes. Try this healthy green smoothie with frozen mango. Appeal to their inner superheroes. My parents were onto something when they used to remind me how Popeye was strong because he ate his spinach. A 2012 study found that school children ate twice as many carrots when they were named “X-Ray Vision Carrots” (2). 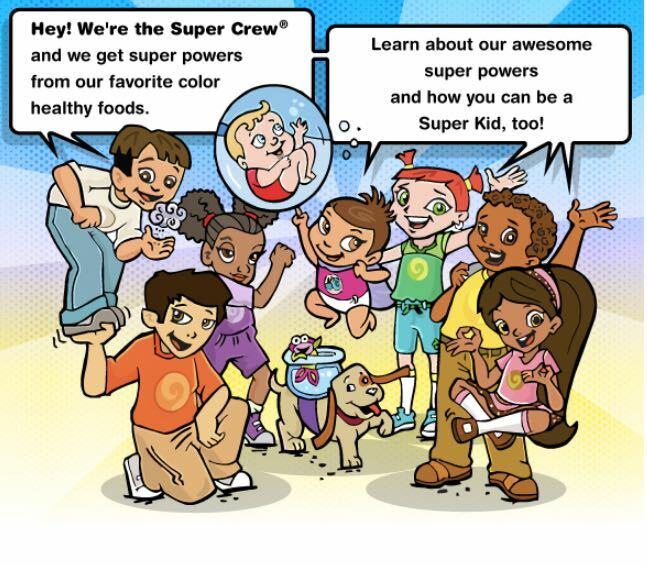 Utilize the Super Crew books and activities to inspire your children to eat more healthy! Explain to your children that “Hulk Hummus” will help them grow big muscles, or that “Speedy Sprouts” will give them the energy to run faster. Store the good stuff in plain view. Both children and adults are more likely to eat foods that are visible and convenient. 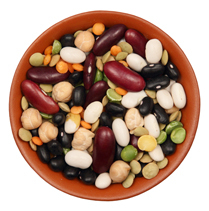 Place a bowl of ready-to-eat, toddler-safe fruits and vegetables on a table. Give fruits and vegetable curb appeal! 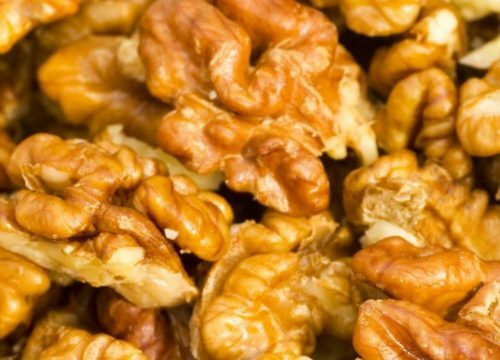 Store less-healthy treats out of sight. How much fiber is in one medium apple with skin, compared to one cup of apple juice? Name one way to encourage toddlers to eat healthier?